Yesterday (8/12/2012) the fifth MFC gala took place in Nowa Sól. 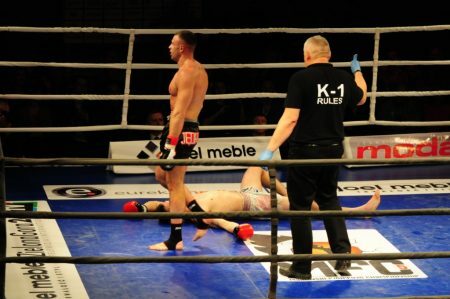 Among Polish and foreign players there were Paweł Jędrzejczyk, who faced Eddie Gill from England. The fight for the title of the International Professional Polish Champion Muayy Thai took place at the distance of 3 rounds for 3 minutes and ended with a win for points by Paweł. During the fight Eddie Gill was counted in the second round three times and only the miracle did not end with a knockout. Thanks to the victory Paweł won the seventh professional belt and the seventh title of the Polish Champion. Plans for the near future? At the beginning of the new year, a trip to trainings to Bangkok, and until then rest and recuperation.